For accurate and convenient microscopic calibration and measurements we offer our 20mm linear reticle. 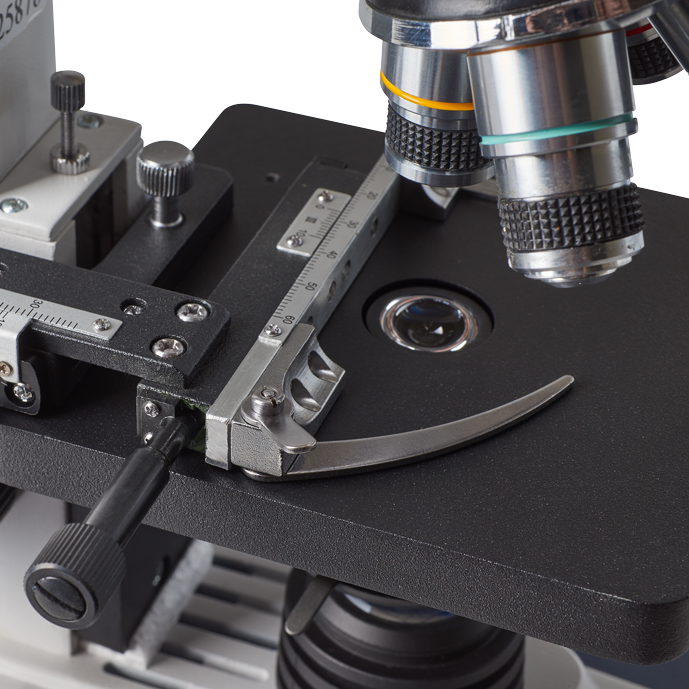 The Omano OM-118-M4 monocular microscope is the sister microscope to the OM118-M3 but with an additional 100x objective lens and a mechanical slide holder for easier slide handling. Like the M3, this M4 version is an affordable alternative to the OM136C series and was introduced in 2010 in the light of the weak economy. While it lacks some of the professional features and construction of the OM136C, the OM118-M4 has the advantage of including the extra objective and slide holder. 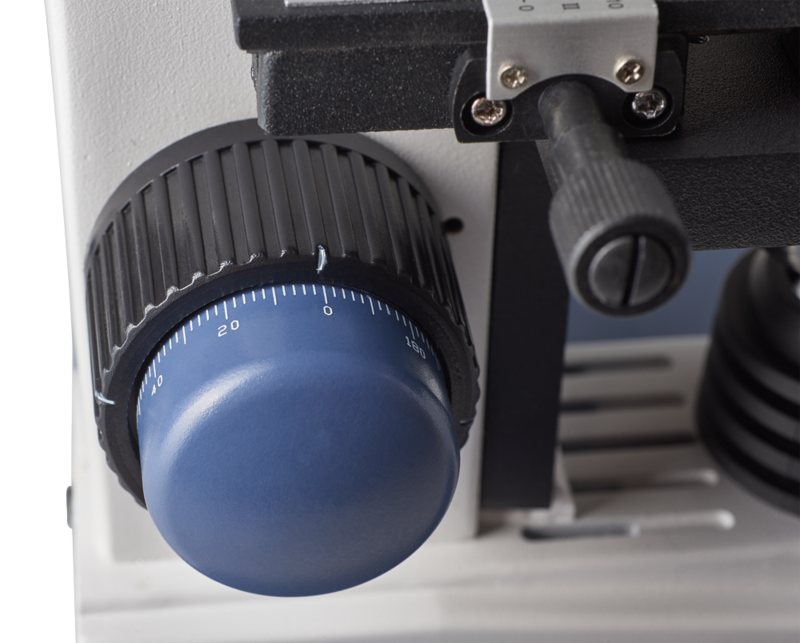 The microscope includes four achromatic objectives for viewing cell structures on slides, a mechanical slide holder and transmitted illumination. It also includes a 5-year Omano Lifetime limited warranty. Recommended for K-12. The Omano OM118-M4 is a high power monocular microscope used for viewing cellular structures on slides. The ocular is angled at an ergonomic 45 degrees and rotates through 360 degrees for flexible viewing. A single WF10x eyepiece combines with four achromatic objectives lenses (4x, 10x, 40x spring, 100x spring oil immersion) for magnification levels of 40x, 100x, 400x. and 1,000x. The microscope includes a plain stage with mechanical slide holder that enables easy slide movements on the stage. Focusing includes rack and pinion design for durability and coaxial coarse and fine focus controls. 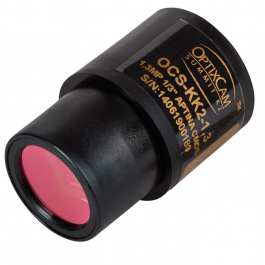 We recommend coaxial coarse/fine focus controls since they enable 'eyes down' focusing. In other words, the viewer does not constantly need to look up in order to find the other focus control. 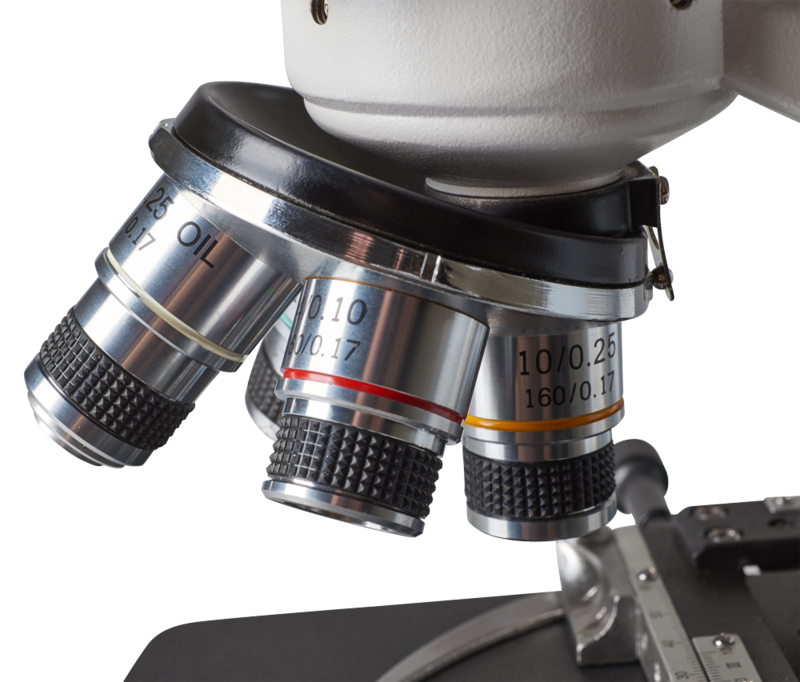 This benefit is important in enhancing a student's experience and therefore in encouraging a more sustained interest in the microscope. Safety features include a rack stop to ensure that the stage does not impact with the objectives and thereby break the slides and a slip clutch control to mitigate the risk of damaging the focus controls through over extension. The condenser is Abbe 1.25 N. A with iris diaphragm for optimal adjustments. Transmitted 20w incandescent illumination includes variable intensity. Shipping Wt. and dimensions: 7 Lb. 18"x12"x9". All the Summit Series microscope cameras stand out for remarkable color resolution as well as a large color palette for improved color resolution and sensitivity. Critically, they are free from the smearing and blur that characterizes other systems in this price range. In addition, the included 0.5x reducing lens makes for an image that is significantly closer to that seen through the eyepieces with the naked eye. 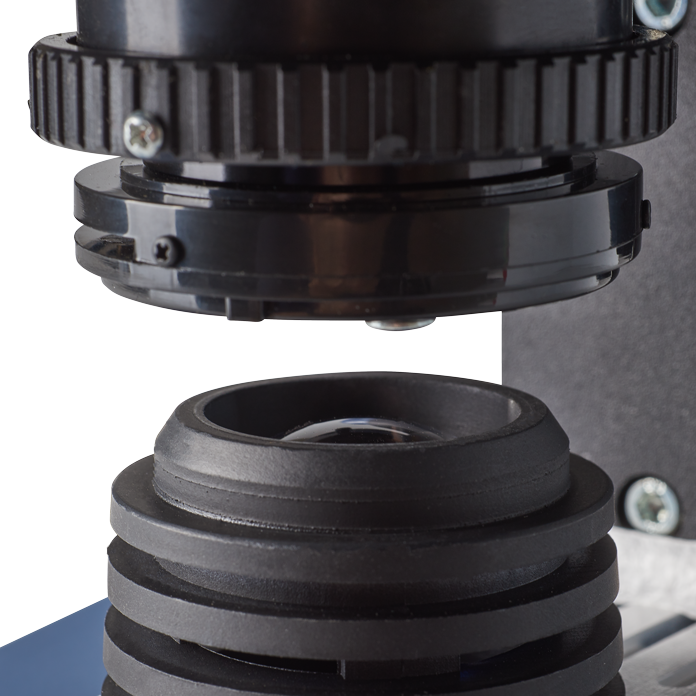 Robust documentation and measuring software is included with all the OptixCam cameras as well as four different mounts: C/CS Mount, 23mm eyepiece adapter, 30mm and 30.5mm collars so they will fit almost any microscope. Other features include fast refresh rates, auto/ manual exposure and white balance control, full screen live imaging, time lapse photography and user-friendly, image capture. 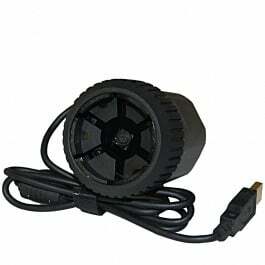 In short, these microscope cameras offer a well-designed package at an affordable price. We recommend them for any standard photomicrography application where the primary requirements are image capture and documentation. 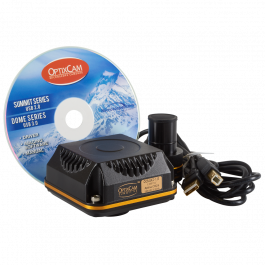 CD-ROM Software disc, 30mm collar, 30.5mm collar (collars not included with OCS 350K), 0.5x C-Mount adapter for 23.2mm eyepiece port, USB 2.0 Cable, Quick Start Guide, Calibration slide. Better than the OM115 and OM116 and introduced as a more affordable alternative to the OM136, with similar optics. See OM-118-M3 for the more economical version of this compound microscope. 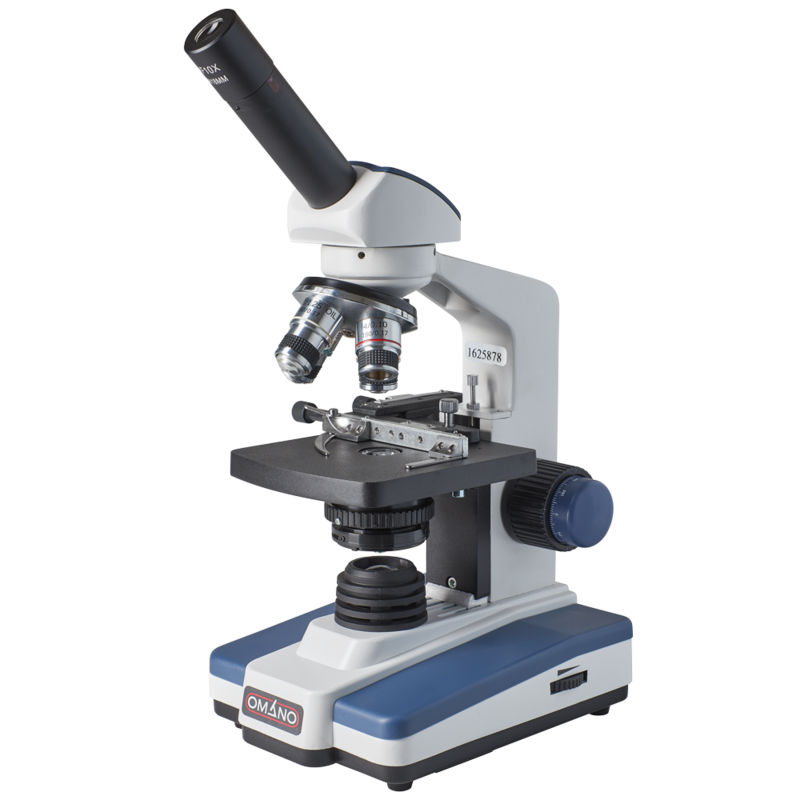 Summary The Omano OM-118-M4 monocular microscope is the sister microscope to the OM118-M3 but with an additional 100x objective lens and a mechanical slide holder for easier slide handling. Like the M3, this M4 version is an affordable alternative to the OM136C series and was introduced in 2010 in the light of the weak economy. While it lacks some of the professional features and construction of the OM136C, the OM118-M4 has the advantage of including the extra objective and slide holder. The microscope includes four achromatic objectives for viewing cell structures on slides, a mechanical slide holder and transmitted illumination. It also includes a 5-year Omano Lifetime limited warranty. Recommended for K-12. 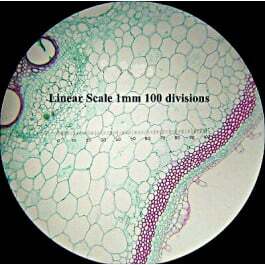 Optics The Omano OM118-M4 is a high power monocular microscope used for viewing cellular structures on slides. The ocular is angled at an ergonomic 45 degrees and rotates through 360 degrees for flexible viewing. 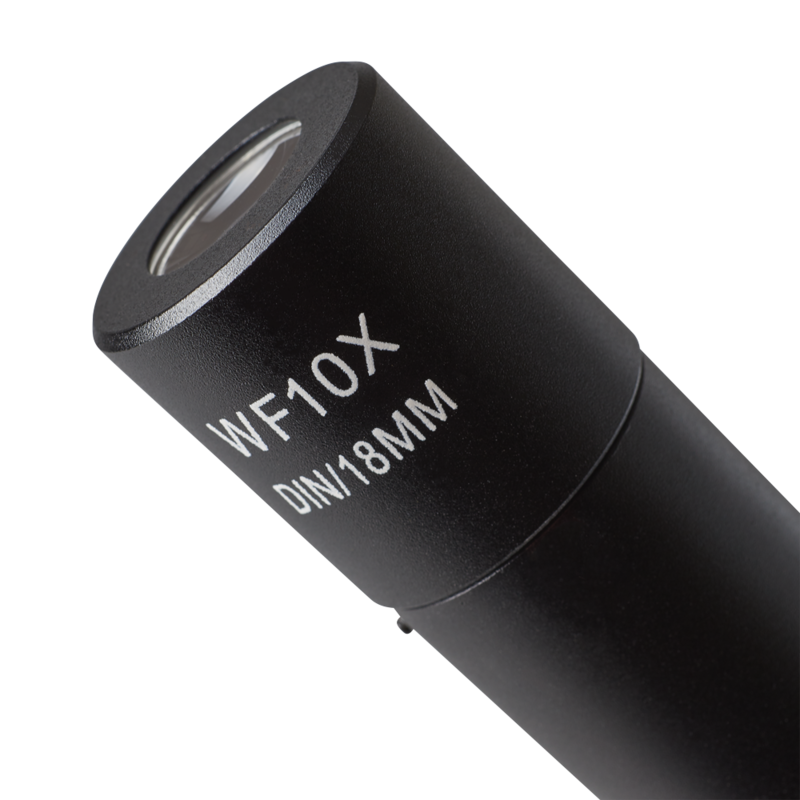 A single WF10x eyepiece combines with four achromatic objectives lenses (4x, 10x, 40x spring, 100x spring oil immersion) for magnification levels of 40x, 100x, 400x.